Do you live in Wake County and have questions about the removal of the Milburnie dam? Perhaps you’d like to find out more about mitigation banks and the environmental benefits? Or maybe you’ve got a vision for how the new unified park should be developed? All we ask is you keep it clean and respect your fellow commentors! Just curious – are there any more dams downstream from Milburnie? … Or, once this dam is taken out, will that create a damn-free river from Raleigh to the ocean? There are no more dams downstream from Milburnie. The Neuse will be dam free from Raleigh to the ocean. I think it would be awesome to have a map on a webpage somewhere, that shows the major NC rivers, and color-codes each river green downstream from the last dam, and non-green (red?) upstream from the last dam. And maybe mark all the dams with an ‘x’ and have it where you can hover over the dams to see the names. If someone could get me the river data (lat/long points along the path of the rivers), and the lat/long locations of the dams, I would be happy to create such a map. Good idea Rob! I will see what I can do about getting you some map info. If you could get complete data, you will be shocked how many dams there are out there. Must have been cheap to build back then. The Milbunie dam is scenic. The water above the Dam is great for kayaking and motor boating. I kayak the Neuse regularly, from the Falls of Neuse dam to New Bern. The river below the dam to Crabtree Crrek is very shallow much of the time. Curiously, the river below Raleigh’s waste water outfall and the river above the dam are great for boating. Portaging the dam is easy. I also bike the Neuse greenway and fish below the dam with our grandson. I vote to leave the dam alone. 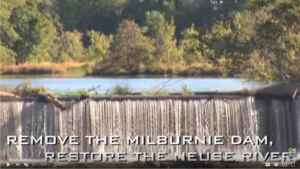 There are other reasons, mainly ecological to remove the dam as noted in the Milburnie Dam informational video. You will still be able to bike the Neuse Greenway and fish below the dam once it is removed. There will be NO tax dollars spent on the removal of the Milburnie Dam. Restoration Systems pays for the removal that will generate stream credits to be sold for development throughout Wake and other surrounding counties. Everyone should ask how much money Restoration Systems will get by removing the dam I think they will profit by selling environmental credits to other companies. I doubt if the environment is a main concern. Many small dams have been removed in NC destroying several ponds and small lakes that we have all enjoyed. Imagine what will be left when the dam is removed. Trust me, you will miss the dam and it’s lake when it is gone. Batteries and tires are present in the riverbed in May 2010, which is about 5 years after the removal. Will this be cleaned up too? Doubt it. You’ll Miss IT if you don’t listen to Dourel’s last words on his Milburnie Dam video. There is quite a bit of misinformation in this video. The powerhouse and all dangerous equipment will be removed along with the dam. Could this dredging/sediment removal accident happen during the Milburnie Dam removal? See the video and get an idea of what we may be in for. There will be no dredging for the Milburnie Dam removal. Sediment removal will happen naturally as the river is restored back to its original flow. Maybe you can answer my question – I have heard that the stream credits created by the removal of Milburnie Dam will be used to build a dam on the Little River to create the Little River Reservoir, a future source of drinking water for Raleigh. Do you have any information on that? They’re too busy getting ready for their Dec. 6 meeting to answer your question. The Little River Reservoir has been stopped. Is this a *very* recent development? In October of this year, the City gave another $350,000 to pay for the preparation of the EIS for the LRR. And I just found this article “New Reservoir May Be ‘Inevitable’ for Raleigh” from Oct. 19th – http://www.raleighpublicrecord.org/news/2012/10/19/new-reservoir-may-be-inevitable-for-raleigh/. The only thing I can find on the “stopping” of the LRR is the article you linked and that does not give references. Was it a Raleigh City Council decision? Wake Co. Commissioners? Will the Neuse look anything like these videos of the Little River? The Neuse will be restored back to its natural state as it should be. If people want to envision what the Neuse will look like after the dam removal, they should visit the river starting about 1000-feet downstream of the dam. What about the present state of upstream wetlands and the aquatic life it currently supports? Is this a concern? How is this issue addressed? How will you ensure that the areas immediately upstream of the existing dam are restored to resemble and have features similar to that of the rest of the river? What plans have been submitted and reviewed by DWQ and the Army Corps thus far? The upstream wetlands have been evaluated and continually monitored by outside consultants for our baseline monitoring data proposal. The dam removal has been proposed as a slow removal over several months so as not to disturb the aquatic life upstream. The Prospectus was submitted in 2011 and put on public notice. You can also find it on the “Blog Talk” section of this website. Currently the Mitigation Banking Instrument and Mitigation/Restoration Plans have been submitted and are currently under review and confidential until approved. I have biked the Nuerse River Greenway above and below the dam and kayaked the river from the Falls of Neuse Dam to Craven County. 1. It will destroy beautiful and valuable wetlands above the dam by draining the water in them. Walk or bike the greenway to the bridge about a mile above the dam and see the magnificent strecth of marsh grass and waterfowl habitat that will be drained if the dam is removed. There are several such streches above the dam. 2. The river below the dam is shallow and difficult to navigate, even in a one person canoe. Stand on the new bridge across the Neuse below the dam and you will see the silt deposits that make kayaking difficult and boating impossible; these deposits continue down stream until Crabtree Creek and the Raleigh waste water discharge [which is the cleaner than the river] gives added depth. The river above the dam is navigable by boat and kayak and is magnificent. 3. Property values along the river abover the dam will be reduced. Curently home owners have docks and boats – neither swimming or boating will be possible because of the low water depth if the dam is removed. 4. Deaths by drowing are always tragic. However the deaths are caused by high water and turbulent currents, not by the dam. High water and turbulent curents are caused by heavy rainfall. Only someone immdiately above or below the dam is in danger of currents caused by the dam. 5. The dam is a scenic and historic part of Wake County. The park along the river, now enhanced by the greenway bridge, is a great spot for picnicing, fishing, and relaxing. Removing the dam will remove a delightful scenic attratction to our county. There are four primary goals stated in the official proposal for the removal of the dam are: 1) to improve water quality; 2) to establish an aquatic community that is appropriate for a river rather than the current community that is more typical of lakes and ponds; 3) to facilitate habitat restoration for and re-colonization by rare, endangered and threatened aquatic species; 4) and to open approximately 15 miles of river to spawning migratory fish. You will still be able to bike the Neuse Greenway and fish below the dam once it is removed. Also – being that the Neuse Greenway is along the river in the dam area it is an attraction for more people which means more of a danger for people swimming in the area. As quoted from Lynnette Batt with American Rivers: “A key point remains: the dam is privately owned, privately paid for and maintained, by a family that would like to remove it because it is no longer serving a purpose. This is not a public decision. Unless, as Dr. Martin Doyle pointed out in an op-ed last year, those who would like to see the dam remain would like to make an offer to buy it — and take on the costs, liabilities, and requirements that go with it. It’d be nice to respond directly to Art’s points, rather than listing a series of unrelated points of your own. To these I’d add, 4) If the primary goal is environmental, why will former wetlands be developed, which I believe is Restoration System’s funding mechanism, rather than preserved? And a final point: the idea that dam removal will save lives seems a play on emotions, not a real argument. It makes me suspicious of the motivation behind this project when I keep seeing such blatant appeals to emotion. Eleven people have died in 83 years. While I sympathize with the victims, one drowning every 8 years doesn’t seem to justify wholesale destruction of the dam. Many more people drown in nearby lakes and we’re not draining them. It’s not safety that’s an issue here but environmental and financial considerations. I’ve heard much about the former, virtually nothing about the latter. Can you address what’s at stake financially? Are developers lining up to take advantage of what will be newly claimed and newly valuable real estate? Your questions can be answered at the Milburnie Public Information Workshop being held tomorrow, December 6th from 6p-8p at the Holiday Inn Raleigh North, 2805 Highwoods Blvd, Raleigh, NC 27604. With all respect, that seems like a cop-out. What if I can’t make it to the meeting? Aren’t forums like this set up to hear from–and respond to–the public? It’d be nice if the answers to these questions were posted online for all to see. I will get the questions answered. Most of them have been answered on other public forums and just haven’t been posted to this site yet. The public meeting will be video recorded and posted on this site in case you cannot make it to the meeting. What’s the update on Art’s and Tex’s questions? Why can’t they be answered here also? free flow to the sea, worth it. Also conflicts with Raleigh’s goal of wetland protection in the river corridor. Explain how this conflicts…seems as if there will still be a Milburnie Park. The obvious and economic common sense solution is to build a migration channel or “fish ladder” . This effectively covers eveyones concerns and is far less expensive and less environmentaly impactive. Why should we help make someone rich selling environmental credits and removing a dam unnecessarily. This does more harm environmentaly because the money comes from offsets that are purchased to allow corps to knowingly pollute. Jason, you are exactly right. I’ve been thinking this since I found out about the proposed removal. I’ve had plenty of experience with the buydown credits and know how Restoration Systems plans to make their money. It’s pretty disgusting. Love the dam and the upstream wetlands it supports, what outstanding natural beauty now the greenway bridge is in place for all of us to enjoy. Watched video showing RS version, when the water is low you can not get to the dam area in a canoe unless the dam stays in place. Create a fish ladder and let the dam stay. Does anyone know the current status of the proposed dam removal? Bob- Restoration Systems is still in the due diligence process with the state agencies in getting the Mitigation Banking Instrument approved. What about fish ladders? I’ve seen them work in lots of other places. We get to keep the upstream wetlands and the shad would get to re-establish their upstream spawning grounds. A win-win! When will tear down start? All the wetlands created by the dam will dry up and river will just a ditch where will not be able to even canoe except after rain!